done!, originally uploaded by Tashabear. Doesn't even hurt... right now. I'm sure it'll itch like an itchy thing Real Soon Now. I love the design! Very nice! Ooh - That is deeply fantastic. I like the design ... does it represent anything specific or is it simply graphic art? I love the design, but I'm really staggered by the perfection of the scale of the thing - it looks like the most natural thing in the world to see on your shoulder, like you were born with it there! the beastlyboy (who is here visiting, yay!) and i both agree that the ink is very very VERY cool!! congrats! Very bold and artfully done, indeed! It's gorgeous. I love how it incorporates 3 different Celtic designs in the bears, too - it looks like a great unity symbol, and the bears are just perfect for you. Beautiful! 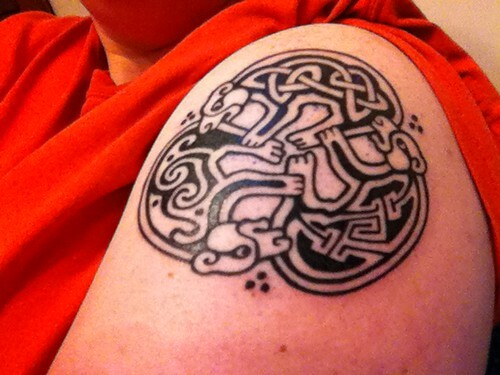 I loves me some Celtic knots!